One of the greatest sandbox strategy games. The most wonderful turn based fantasy strategy game. Popular multiplayer action RPG by Blizzard. of the greatest game of all times. Exciting role playing game with ral time combats. Another amazing space exploration and colonization. The most exciting massive multiplayer online RPG. An extraordinary hex strategy, forgotten in the ashes. A space game combining all game genres and types. 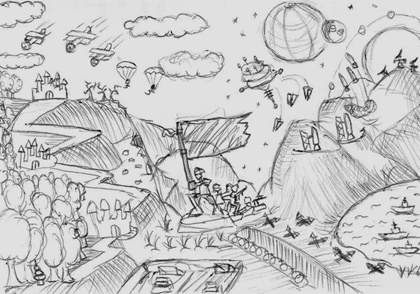 The most awesome Mars colonization real time tactic. Screensot puzzles to explore and study the history of video games. More than 25 online puzzles about the greatest computer games by types, that may be used to decide what to play next. The game screen puzzles are small online applications, up to 1 MB, which present some of the most awesome games, released through the years. These fun game reviews include reference from some of the most popular games, or not so popular for some, but still worth attention. Interactive video game previews about the greatest computer games for all times. All screen puzzles can be played online in a web browser. They are made like a presentation of the PC game, including the game type, the year of release, the game genre and a screenshot from the game, made by Ogo Bob himself. This is an interesting way to learn about some good PC games. There are a lot of great games out there, and other not so great. But the games in this category should be studied in schools, like we study basketball and voleyball. If you wander what to play next, these are very good titles to try. Fun game reviews. Interactive game Previews. Computer game preview puzzles. Craft the World Screen Puzzle - A comfortable house in the 2D world building PC game. Eador: Genesis Screen Puzzle - Capital buildings in the fantasy turn based strategy game. 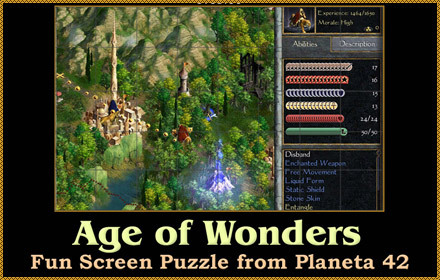 Age of Wonders 2 Screen Puzzle - Hero statistics in the turn based strategy fantasy game. Civilization 5 Screen Puzzle - Inca special tiles in the most popular TBS 4x4 computer game. Galactic Civilization 2 Screen Puzzle - Planet development in the TBS 4x4 space game. Space Rangers 2 Screen Puzzle - Galactic exploration map from the RPG mix PC game. Disciples 2 Screen Puzzle - Combat screen in the isometric TBS fantasy game. Rites of War Screen Puzzle - City siege in the futuristic hex turn based strategy game. Majesty 2 Screen Puzzle - Elf statistics in the fantasy real time strategy game. UFO: Afterlight Screen Puzzle - Combat screen in the real time tactic aliens computer game. Stellaris Screen Puzzle - Planet population in the space real time strategy PC game. Zeus Screen Puzzle - A mighty settlement in the sim, city management ancient game. Dungeon Siege 2 Screen Puzzle - Inventory screen in the fantasy role playing game. World of Warcraft Screen Puzzle - Dragon meeting from the popular MMO role playing game. Diablo 3 Screen Puzzle - The spoils of war from the famous action RPG video game. Fallout Tactics 3 Screen Puzzle - Armored team in the post apocalyptic role playing game. Starcraft 2 Screen Puzzle - Siege tanks defense wall in the famous real time strategy game. The Sims 4 Screen Puzzle - Teaching chess play in the lovely live simulator game. Jagged Alliance 2 Screen Puzzle - Merc position in the amazing turn based tactical RPG. Fantasy General Screen Puzzle - Low level units in the most awesome hex TBS old game. Open X-Com Screen Puzzle - Armored team in the modern remake of UFO 1 TBT game. 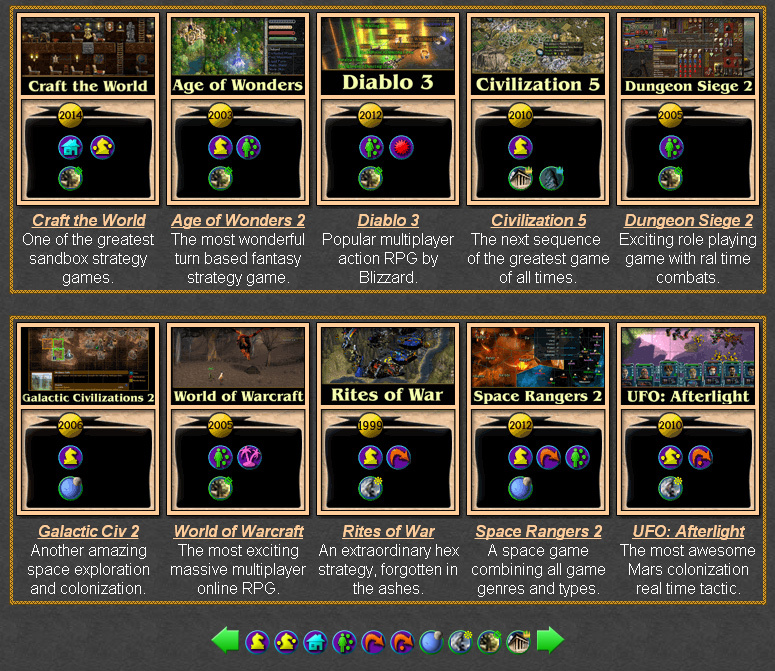 Warcraft 3 Screen Puzzle - Rexxar hero in the fantasy real time strategy game. Some of the greatest PC games in a fun online screen puzzle. Someone from Planet 42 had this strange idea, that a review about a game, may be actually another game, or just a small fun puzzle. And the knowledge about video games is not to be underestimated. These fun game previews are fast and there is not much for reading, beside some base statistics about the game. The interactive game review may be fun too, as it needs a little interaction, while all pieces of the puzzle are sorted, which represent a screenshot from the game. With this fun puzzles, we also acquire new knowledge, therefore completing every game screen puzzle will also reward +1 Knowledge Level. Find good games by interacting. Turn Based Strategy - This collection includes fun screen puzzles with the best TBS game titles since 1994. Real Time Strategy - This collection includes fun game preview puzzles with the most exciting RTS game titles since 1998. Simulators - This collection includes online game review puzzles about the most addicting SIM, management and tycoon game titles since 1995. Role Playing Games - This collection includes fun game screen previews about the most amazing RPG titles since 2001. Turn Based Tactic - This collection includes fun game screen reviews about the most awesome TBT game titles since 1996. Real Time Tactic - This collection includes interactive game reviews about the best RTT game titles since 2001. The Interactive Game Reviews website include: fun screen puzzles, screenshot puzzles, video game previews, interactive game reviews, what to play today, what to play next, best computer games preview, exciting games to play, game type puzzles, game review puzzles, and more than 25 online puzzles about the greatest computer games by types, that may be used to decide what to play next. Here is the blog with the Best Games Ever.